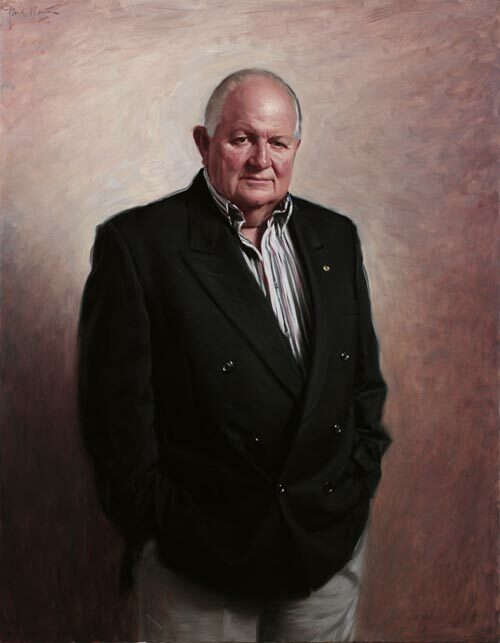 A hugely successful businessman with a 30-year career in the shipping industry specialising in VIP freight forwarding, Pat Corrigan AM is a great lover of the visual arts and jazz music and is one of Australia’s leading philanthropists. He collects contemporary art with a particular emphasis on photography and has sponsored art and music awards including the NAVA Pat Corrigan, which ran for 14 years. He is currently a director of the Gold Coast Arts Centre and chairman of the Gold Coast Regional Gallery. Paul Newton has known Corrigan for a number of years, bumping into him at various art shows. “I thought he’d make a great subject for the Archibald but it’s taken us a couple of years to make it happen.” Newton went to Corrigan’s home on the Gold Coast for sittings and got to see some of his art collection: “quite an inspiration,” he says. Born in Sydney in 1961, Newton is a much-commissioned portrait artist. After completing a science degree at the University of Sydney, he did a Diploma of Art at the Julian Ashton Art School. This is the seventh time he has been selected as an Archibald finalist. His portrait of Roy and HG won the 2001 Sydney and Melbourne People’s Choice. His portrait of Australian rugby player David Campese, a finalist in the 2000 Sporting Portrait Prize at the Art Gallery of New South Wales, won first place in the Portrait Society of America’s 2002 International Portrait Competition. Newton won the same competition in 2003. Recently, he has painted a number of portraits for Columbia University in New York, including NBA Commissioner David Stern, Chair of the Board of Trustees in 2005.